The GMB Friday Seminar Series welcomes Jonathan Pritchard, Professor of Biology and Genetics at Stanford University on Friday, May 3, 2019. 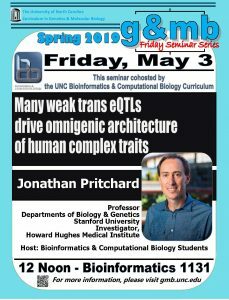 Dr. Pritchard's talk title is “Many weak trans eQTLs drive omnigenic architecture of human complex traits”. The UNC Bioinformatics and Computational Biology Curriculum Graduate Students host this talk. This talk is in UNC’s Bioinformatics Building in room 1131. *This is the final talk of the Spring 2019 GMB Friday Seminar Series.